This looks rather familiar... A bundle of balls, stuck to the top of the gameplay area in a hex grid slowly moving to the bottom, and the player throwing balls up to match colours and make them disappear? Yes, it's another Puzzle Bobble / Bust-a-move clone, but hold on a minute. That might be the starting point for Magnet Balls, but there's a new twist on an old classic that works. The big difference? Well, the title sums it up. Rather than have some mysterious floating balls in the sky that have incredible powers of adhesion to maintain their location, this game is played with balls that are magnetised. That explains how they are stuck to the top of the screen, and how the balls that you throw up the screen can stick to other balls. The twist here is less of a twist, and more of a stacking issue. 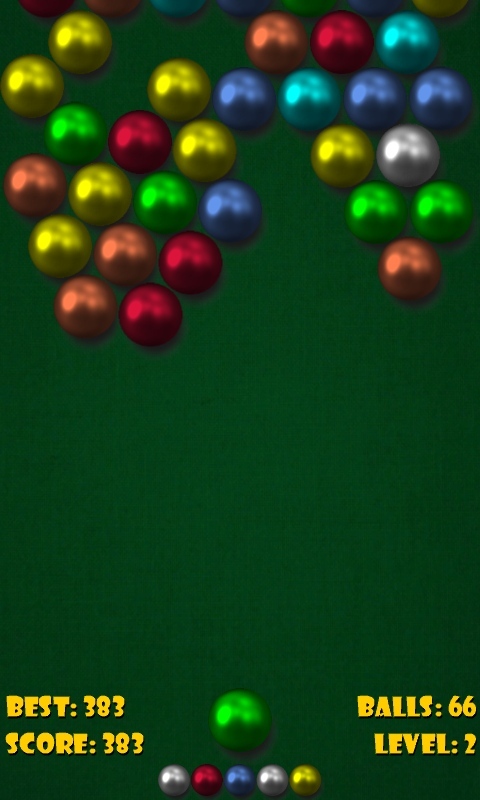 The balls remain magnetised, attracting each other throughout the game. That means when you match some coloured balls and they disappear, the remaining balls will try and move closer to each other. They could fit in the gap, they could roll around, or they could change the way they are hanging. You'll see the balls laid out in a hex grid layout a lot, but that's down to simple physics and the packing principle. Once you add in some gaps, a bit of weight with long chains of balls hanging down and bouncing more magnetic balls around the grid, it'll start to deform slightly. While Puzzle Bobble had very sticky balls (once a thrown ball touched any other ball, it stayed there), you'll find that the magnetic balls react differently when they reach the game grid. All of this means that, while Magnet Balls does feel very familiar to the long term gamer, it has a character and a style of its own. By using the Farseer physics engine to presumably calculate the movement of the balls, everything feels right. Mentally working out what might happen and then seeing (broadly) the same result happen on screen gives you confidence, when playing, that everything works just as you would expect. The in-game controls are simple enough. 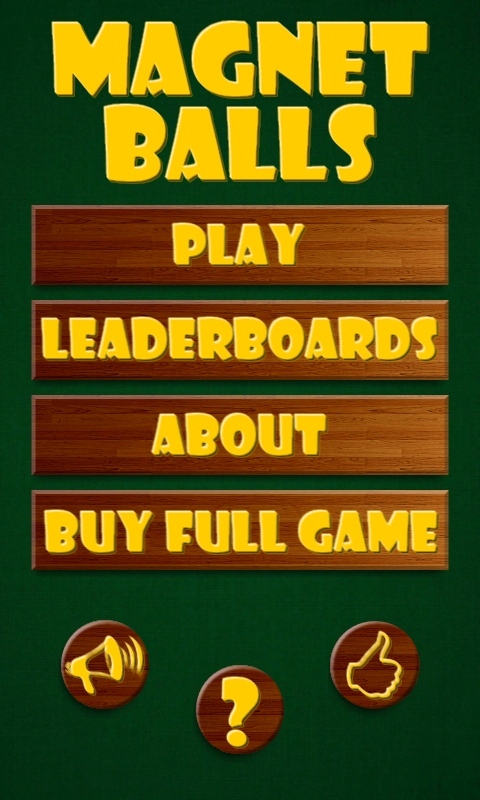 The ball will launch itself from the bottom of the screen (from the centre), will travel in a straight line to wherever your finger touches the screen, and bounce off the sides and stick to other balls during travel. All very intuitive and allows you to concentrate on the results of the moves, rather than the moves themselves. I would like to see a bit more focus on the ancillary gameplay. 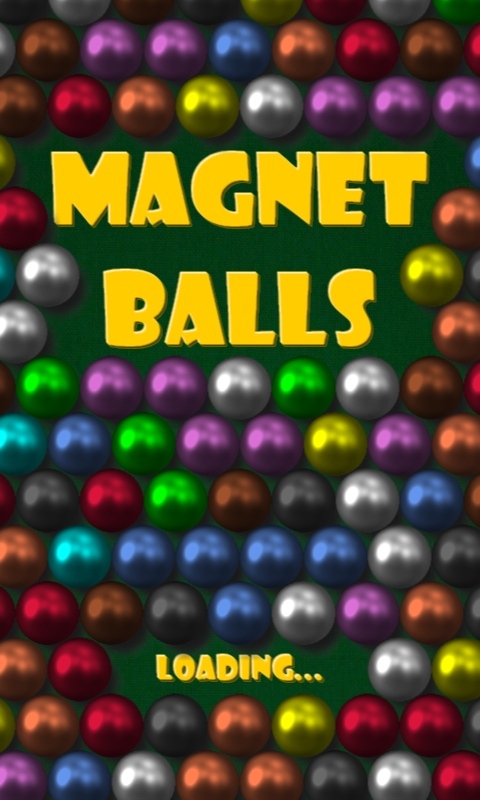 While Magnet Balls has got the mechanics of playing the game sorted, other areas are lacking the same polish. It's far too easy to play on account of the speed of the balls slowly moving down the screen (when they reach the bottom, it's game over). 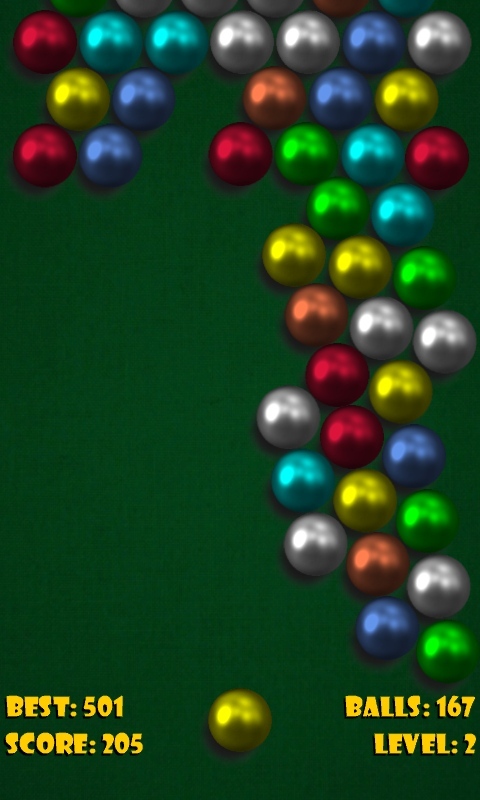 Magnet Balls needs to get harder, faster, to provide a long-lasting challenge for the player. It also needs to emphasise the high scores a lot more. Creating combo chains of balls disappearing in a cascade effect is fun, and builds up the points, but points need to be treasured. A high score table tucked away behind the splash screen is not enough. There's a lot of promise here for a classic arcade title. As it stands, developer Crazy Owl has had a great idea to tweak the gameplay of a long standing favourite... but the other elements of the package need the same care and attention to lift Magnet Balls into the pantheon of games that would be recommended without hesitation.